1) Before booking a guest ranch vacation find out whether the guest ranch that you want to go to offers lessons for first time riders. If it is your first time let them know in advance that you would like some lessons. 2) Make sure to take sensible riding clothes with you and a cowboy boots if you have them. If you don’t have riding boots you don’t need to buy them unless you want to. Most guest ranches have boots on -hand that you can use in various sizes. Take a couple pairs of jeans with you as your legs can chafe against the saddle if you don’t wear long pants. 3) If it is your first time riding a horse, wear a helmet when possible to protect your head in case you fall. 4) Horses have blind spots so avoid approaching a horse from behind or from the front to avoid getting kicked from a startled horse. It is better to approach them from the side where they can see you. 5) In the beginning use a mounting block to get onto your horse and always mount from the left-side. 6) When you are riding a horse on your guest ranch vacation try to remain calm and relaxed. Horses are very sensitive creatures and they can feel if you are uncomfortable and not in control. Be patient and take deep breaths until you feel at ease. 7) When riding a horse keep your heels tilted down while in the stirrups as this will prevent you from flying over the horse’s head if your horse has to come to a sudden stop. 8) When riding a horse, keep your head upright and sit firmly in your saddle and maintain a good posture. Don’t wave your arms around in the air. 9) To stop, pull your reins back and sit deep in your saddle. Don’t pull too hard as a horse’s mouth is very soft and sensitive. 10) Most importantly try to have fun and enjoy your surroundings and your horse. These are just some of the basics that you will learn about horseback riding while at the guest ranch of your choice. Once you feel comfortable with the basics you will find that horseback riding is a fun way to spend time on vacation. There are many other activities at a guest ranch aside from riding but spending time with horses is definitely one of the most enjoyable. 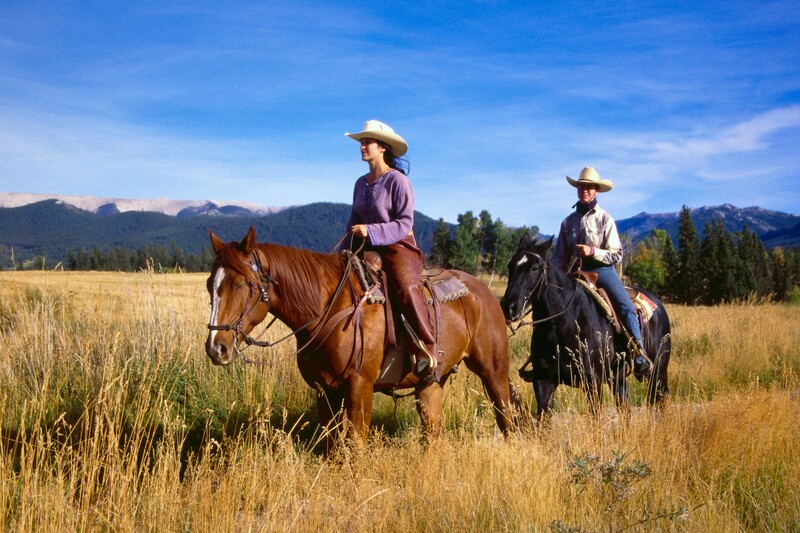 Find your next guest ranch vacation today using our Dude Ranch Finder.